From left to right, George Ehara of project contractor Swinerton Builders, Hawaiian Home Lands O’ahu Commissioner Kama Hopkins, Kamehameha Schools Trustees Lance Wilhelm and Micah Kane, Kamehameha CEO DeeJay Mailer, Gov. 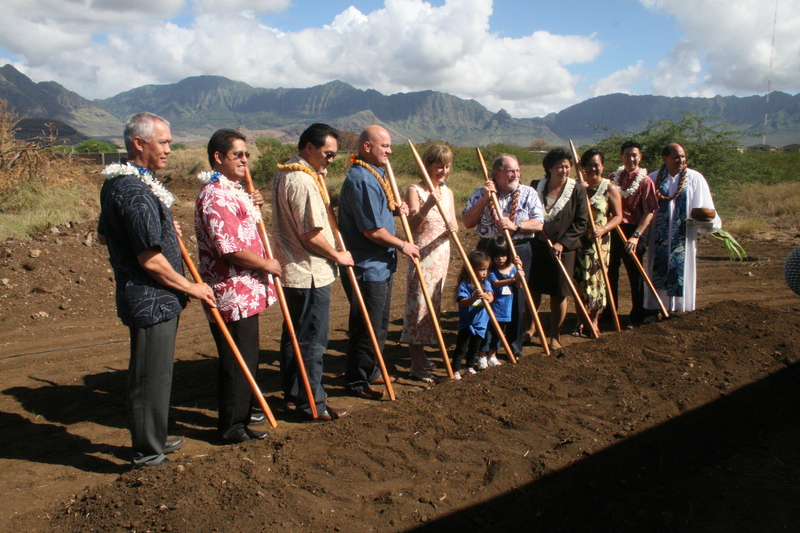 Neil Abercrombie, Kamehameha Trustee Janeen-Ann Olds, Hawaiian Homes Commission Chair Jobie Masagatani, Kamehameha Vice President Chris Pating, and Kamehameha Kahu Kordell Kekoa take part in groudbreaking ceremonies for the Kamehameha Schools Ka Pua Learning Center at Mā’ili held today. Honolulu, HI – Kamehameha Schools’ Ka Pua Initiative and its partners celebrated the groundbreaking of Phase I of its Kamehameha Community Learning Center (KCLC) at Mā‘ili earlier today. 12 Preschool Classrooms being operated by a variety of community organizations including ‘Aha Pūnana Leo, Honolulu Community Action Program (HCAP) – Head Start, the Institute for Native Pacific Education & Culture (INPEACE) Keiki Steps program, Kamehameha Schools Community-Based Early Childhood Education program and Wai‘anae Coast Early Childhood Services. These classrooms will create 185 new preschool seats for keiki and expand preschool capacity from Kahe Point to Ka‘ena Point by 25 percent. An Infant Toddler Center which will house programs like Parents and Children Together (PACT) – Early Head Start and Kamehameha Schools’ Hi‘ilani Early Childhood Family Education. New and expanding families will have access to high quality care for their babies and toddlers during the most important time for learning. An Early Learning Kauhale will provide office and meeting spaces for organizations who have long-served the Wai‘anae Coast to work side-by-side to best serve keiki and families. Located between Kaukama and St. John’s Rd. in Mā‘ili, the KCLC was made possible through a collaborative effort with the Department of Hawaiian Home Lands (DHHL). In June 2012, the Hawaiian Homes Commission approved a 65-year general lease to Kamehameha Schools for 40 acres on the former Voice of America site to develop the learning center. Swinerton Builders Hawaii has been selected as the general contractor for Phase I of the KCLC, which was designed by architect, MVE Institutional with environmental assessment and entitlement planning by PBR Hawaii & Associates, Inc. The projected cost of Phase I is $33 million and will cover roughly 10.28 acres of the 40 acre site. Construction on the site will begin in November with an anticipated open date of August 2014 for the on-site preschool programs. Future phases will also include expanding educational supports for youth and adults. The construction of the new learning center represents one of the three strategies identified by Kamehameha Schools for Ka Pua. Other strategies include supporting collaborations with service providers who are focused on key impact areas (reading and math proficiency, graduation rates, etc.) and ensuring schools are centers of the community and take a holistic approach to supporting students by providing a range of services. Launched in 2009, the Ka Pua Initiative is Kamehameha Schools’ long-term commitment towards supporting schools , community organizations and service providers in laying a foundation of innovation and high educational expectations on the Wai‘anae Coast. The Wai‘anae Coast of O‘ahu is home to the largest concentration of Native Hawaiians in the world. By working within Hawaiian communities to strengthen schools and other educational providers, Kamehameha schools will not only serve Hawaiian families, but will help to lift the level of education and wellbeing for the entire community. For more information on Kamehameha Schools’ Ka Pua Initiative, visit ksbe.edu/kapua. Kamehameha Schools is a private, educational, charitable trust founded and endowed by the legacy of Princess Bernice Pauahi Bishop. Kamehameha Schools operates a statewide educational system enrolling over 6,900 students of Native Hawaiian ancestry at K-12 campuses on O`ahu, Maui and Hawai`i and 29 preschools statewide. Over 45,400 additional learners and caregivers are served each year through a range of other Kamehameha Schools outreach programs, community collaborations and financial aid opportunities in Hawai`i and across the continental United States. Income generated from its endowment portfolio of Hawai`i real estate and other investments funds the Schools’ educational mission. More information can be found at www.ksbe.edu. Click here for a gallery of photos from today’s event.